Combine cookies, sugar and butter in a food processor and process till everything is combined. Press cookie crumb mixture into 9 inch pie plate. Bake the crust for 9 minutes. Zest limes to measure 3 tsp zest. Juice limes to equal ½ cup juice. In a large bowl, beat cream cheese and sweetened condensed milk together until combined. Stir in zest and juice. Add optional food coloring until the desired color is achieved. Pour mixture into crust and refrigerate at least an hour. Garnish pie with remaining whipped topping and lime slices. 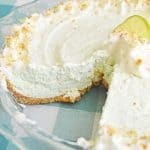 For an even easier pie and completely no bake pie – use a store bought graham cracker crust. Make sure your cream cheese has come to room temp before beating – otherwise you might have lumps in the cream cheese.